"INSIDE THE CREOLE MAFIA", darkly comic and enlightening, presents a contemporary take on a mixed-blood heritage that emerged in the collision of slavery and freedom. In the 18th and 19th centuries they were the "Gens de Couleur Libres", the Free People of Color but today they are commonly known as "Creoles" or "Creoles of Color". 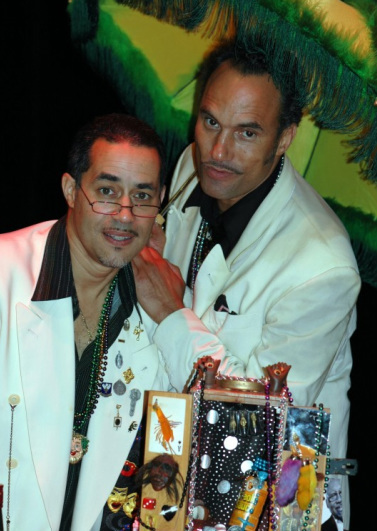 With a blend of humor and savvy mockery, performers Mark Broyard and Roger Guenveur Smith rock the stage in big daddy white suits, silk shirts and ties, pouring Tabasco sauce libations while they "trow" Mardi Gras beads. Smith declares he is "tall, not too dark, and handsome". A brown paper bag goes up next to his face as he assesses whether he is the right shade of color. The definitions of "Creole"--some to their liking, others not--send them out into the audience with vocabulary flash cards that decipher the odd blend of words that are unique to Louisiana, particularly New Orleans. Funny and poignant are sketches on the methods of testing "good and bad hair, " European vs. Afrocentric sensibilities, the confused yearnings of a Catholic Creole schoolboy, and the pigeonholing of the Creole actor in Hollywood. Travis Hammer's scenic design is quirky and colorful. Made up of artifacts, candles, a “fine” tooth comb suspended at head height, a lectern, dictionary, Tabasco sauce, and some odds and ends. It all magically fits with the kaleidoscope of topics addressed or alluded to as the men assault the crowd. Utilizing an artfully lit and designed stage, which gives the right hint of much that is stereotypically New Orleans (Catholic sacraments and hot sauce, Mardi Gras decorations and cafe au lait preparations), Smith and Broyard quickly draw the audience into their inside jokes on Creole culture and tradition. Messrs. Smith and Broyard cajole the audience like they're old friends who've dropped by to sit a spell. Much of the entertainment comes from their emphasis on rhythmic speech patterns as well as their biting commentary on topical issues such as Mayor Nagin’s chocolate city and FEMA. There are moments when we think they are spouting the most confounded nonsense, then sly digs skewer the current administration or social institutions. It takes work to keep pace. First presented in 1992 in Los Angeles, the performance has been re-worked with the addition of a poignant, thought-provoking post-Katrina nod. Broyard and Smith co-wrote the piece, and they serve as on-stage accomplices in this inventive two-man satiric improvisational meditation on race. In New Orleans Creole influence has been waning slowly as some residents have moved away from historic neighborhoods like the Seventh Ward to settle elsewhere, particularly in and around Los Angeles. The impression is that just poor people were displaced, but Katrina has had a devastating effect on the black middle class. Although their tone is humorous, the two repeatedly emphasize the role of racial politics within the moneyed, aristocratic Creole community and the particular role that those politics played in the recent disaster. Of course, considering the massive scale of the tragedy, the show ends on a poignant note. Mostly, though, it is delightfully raucous. Don't make the mistake of thinking that the general hilarity is in any way irreverent or inappropriate. On the contrary, "CREOLE MAFIA" is a savory stew that makes us appreciate the richness and diversity of a city in danger of disappearing. "Anytime people are displaced, you lose a lot of institutional history and institutional leadership and we hear that many of those people may not return because they fear they will not be able to experience the same level of life," says Silas Lee, a well-known pollster, who is also a Xavier University sociologist. "Once you lose that level of institutional leadership and institutional knowledge, it's not going to be replaced immediately and especially when you look at the fact that Katrina altered the demographics of New Orleans overnight." In this mocking homage to ethnic pride, the clouds of Hurricane Katrina billow and build on screens behind the vaudeville, threatening to blow away not only a city, but also an entire era of identity politics. This bristling performance piece, "INSIDE THE CREOLE MAFIA" has toured nationally to tremendous acclaim, playing New York, Miami, St. Paul, San Francisco, and was recognized as one of the Los Angeles Times’ Top Ten productions of 1993 and earning Smith and Broyard, onstage companions and artistic nemeses, nominations for the NAACP Image and Thetare Awards. Now that "CREOLE MAFIA" has returned to tour Louisiana, those of us who didn’t see it unfold the first time must have the same reaction. How did this show unfold before the big wind blew and our current administration showed the world how little they cared about the plight of people who couldn’t afford the gas to drive out of harms’ way? "INSIDE THE CREOLE MAFIA" is a buoyant send-up, sketch-comedy stream of cultural consciousness. It is a searingly powerful, funny look at racism and societal rifts of all types in the city of New Orleans. Non linear in narrative, it creates its own reality where fact and fiction, like race and identity become slippery categories and performance the only truth. Progeny from an old Creole family, Mark Broyard, born in New Orleans, is a vocalist, composer, choir director, renowned assemblage artist and a cultural fixture in the Creole Diaspora. Smith, currently seen in "American Gangster," is a critically acclaimed TV, film and stage actor, with a masters degree in history, whose Huey P. Newton Story earned Obie, Ovation, NAACP Image and Peabody Awards. The two grew up together in the Leimert Park neighborhood of Los Angeles and attended Transfiguration Catholic Elementary School, also attended by many Creole kids. It was obviously a meeting made in Creole heaven.